Here is my updated goals list, with final progress updates. (for full descriptions/rationale behind the goals, click here for the original post). I loved simplifying so much, that I decided not to make a 2015 goals list. It's much more forgiving. I need more flexibility in my life. I will be joining in on a couple of challenges for select months/years, but nothing as onerous as what I put myself up to last year. So. I got almost all the way through this one before I decided the room would need some major reorganization. The important part is that I have made a lot of progress, and it will be easier to put the room back together in an organized/pretty way now that I have the head start. So, success! So.... As part of my December simplify goals, I decided that I was overthinking this room. The munchkins don't sleep over very often. I made a point of getting the room organized and livable.... so, that's a pass. It is so hard to get blog friendly photos of a room that is meant to have messes made in it!! But, I managed--finally--and will be posting photos of the craft space soon. I realize I have been saying "soon" for about six months now, but.... soon! Sew a Stuffed Toy: DITCHEDIf I do ever get around to this one, I really don't want it to feel like a chore. Never again will I add something potentially so cute to a task list. Let's get serious. I haven't knitted anything since 3rd grade. This one was bound to get procrastinated. Happy to ditch it for now and try to reconnect to my knitting roots when I'm ready for it. This is by far my favourite room in the house... My fella calls it the "reading room", and I enjoy that name muchly. One day I'll tidy it up a bit and blog about it... I'm in no rush, though. I enjoy dragging things out, dontchaknow. Also, the room is very comfy and I loves spending time in there more than I love blogging. So there. The theme for December's Choose Your Own Adventure linkup was simplify. Here are my goals, and here is my recap. My December Simplification results: 100% success!!! For the holidays: This needs major paring down. Every year, I make my own stocking stuffers and at least half of my gifts. There are a lot of kids in my family, and we also usually do at least one group gift for a parent. Coordinating a group gift gets to be a headache, frankly, so I plan to avoid that like the plague if it comes up. I also think I will experiment with this foreign concept of buying instead of making all of my stocking stuffers. Also--- gift cards? I have never ever given one before. Maybe now is the time. 100% Success:Christmas was kind of a breeze this year. My fella made everyone a box of Christmas baking, and we paired it with a gift card to a local breakfast place. Babies each got one toy and a gift card to Chapters, and the bigger munchkins got a stack of books. And instead of homemade stocking stuffers, I hooked everyone up with a sample sized Monkey Butter. Bam. Apparently grouping entire households together makes Christmas super easy to accomplish. Operation Simplify is a success! These three boxes hold gifts AND stocking stuffers for five of my siblings & their partners, both my parents, and all four of the munchkins. It's hard to downsize the shopping list with a family this gigantic, but... #nailedit. Merry Christmas!! Around the house: I know this is bold, but I don't want to overthink the house over the holidays. I think if I can not start a new house related project in December, we are good on this front. I might not even bust out the Christmas tree this year. Holiday spirit to me is more about the smell of comfort foods than twinkling lights or glitter making its way from room to room. If simplifying the home decor means more time spent experimenting with holiday recipes, then I am absolutely down with that. I decorated two spots in my house---using leftover decor from the aforementioned baby shower. It was lazy and sparkly and did the trick. Also, GNOME. As you read above, this one was as simple as deciding what to ditch on my goals list. Success! It felt good to let go of the "I should be doing X, Y, or Z right now" guilt. I even got to sit around lazily playing SimCity for a bit over the holidays with my free guiltless time. Hoorah! Overall, I think operation Simplify was pretty successful--and should probably carry over into the rest of my life. Now for January's theme--- "Complete". It's time to get something big off of the to-do list. Scratch it off forever. Finally get whatever it is that is nagging at me out of the way and off of my mind. Complete...my craft room blog post!Yeah. I don't blame you for not believing that this one will get done. Here is a link to the "Before" post I haven't posted the "after" for. Complete...my guest room blog post! Or perhaps I'll call it the reading room. I still think that sounds fancier. Either way, that blog post is overdue. Here's a peek at the before. Complete...one important room in the house. My fella got me a gorgeous chalkboard for my home office, that is small enough that he set guidelines for its use: Only three major projects are allowed on this board at one time. And only once all of the projects are completed am I allowed to add anything new. Top of the list? A room project I haven't mentioned yet, and am keeping a secret. All I can tell you is that it is going to be awesome, and it doesn't involve anyone being pregnant. 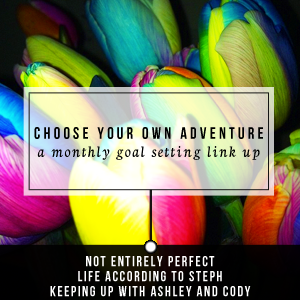 I'll be posting my January updates at the beginning of February, and linking up on Not Entirely Perfect, Life According to Steph, and Keeping up with Ashley and Cody blogs. February's theme is "Create" and is a make-work type goal. Right up my alley. this is my favourite thing about new years. It's looking back at all you've accomplished and being ok with the things that didn't get done, or where just not well thought out goals! The new year is all about possibilities and fresh starts. Not necessarily as goals or resolutions but as things to try or things to finish. You did awesome on December, I love what you decided to do about the gifts. Good luck in January! I'm excited to see the posts, before and after shots are so fun. Thanks, Stephanie! Happy New Year! Letting go is so hard! I keep thinking I'd have more free time if I only used my time more efficiently, but I'm starting to think I'll always fill it up with tasks and I should work on not adding things to my to do list, rather than trying to optimize everything. I don't know. I'm not quite ready to give up on it yet. I love love love that you were like DITCHED on a lot of them. Sometimes I look at a goal and I think, WHAT was I thinking? I'm not going to do this and I'm actually okay with that. While I think it's important to set goals, I also think it's important to live a little and be okay with not completing them sometimes. Great complete goals for January, all totally do-able! I like the ditched by your goals. I should thought of that!!! You did great in December! I like your project board and that your husband put a maximum to the number of projects you can have on the board.